Please read this very important information regarding children travelling on an International cruise onboard the MSC Opera and MSC Sinfonia Cruise liners. 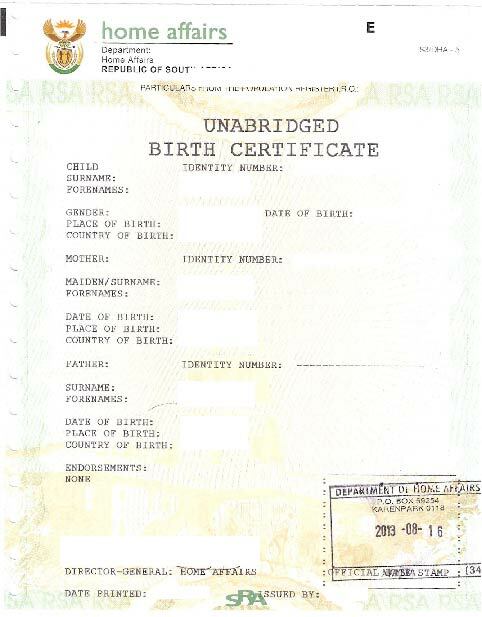 Under the new regulations received from the Department of Home Affairs parents travelling with children are required to produce an unabridged birth certificate for children under the age of 18 years. This is in addition to the child’s passport. One parent travelling with a child? An adult travelling with a child who is not his/her biological child? Q: What documents do parents need to apply? A: Mothers ID, Fathers ID and the child’s abridged birth certificate. There will also be a relevant form to be filled in at Home Affairs offices. Q: What is the cost of applying for an Unabridged Birth Certificate and approximately how long will this application take? A: R75 – According the the Department of Home Affairs the application will take a minimum of at least 8 weeks. Q: Can Clients travel with certified copies of unabridged certificates or do they need to carry the original? A: A certified copy will suffice. A valid passport will be required by all passengers (infant, child or adult) for International cruises and Unabridged birth certificates for children under the age of 18 years old at time of cruise, departing from a South African port travelling to Mozambique, Magadascar, Reunion, Mauritius, Walvisbay. A normal I.D. book will be required for domestic cruises ( Cape Town – Durban, or Cape Town to Cape Town fun cruise, Cape Town to Mosselbay and return to Cape Town). MSC Cruises looks forward to welcoming you on board and thanks you for your understanding.